For almost 100 years, my family owned a house on the coast of Maine. My first trip there was when I was 6 weeks old. My grandparents and parents lived there for at least three to four months each year. I went there a lot. I am surrounded by objects from Maine. If someone buried a picture of the coast of Maine in a pile of random coastline pictures, I would recognize and pick out the one taken in Maine every time. Once I said to my cousin, who had sent me a picture of an island he was on in Maine, “Even if I did not know where you are, I know the light, the temperature, the textures, the look, the smell, and the feel of the place, and I could tell you that you were somewhere in Maine”. It is a special place to me. I live in Williamsburg, Virginia and have for more than 30 years. The beauty and history from the James River to the York River, the tempo and pace of life, watching my children grow up in a little town, and meeting some really interesting people, are a few reasons why I like it here. It is a special place to me. I know a lot of people who really enjoy living here. Lately, I have been asking them where that one picture is that represents Williamsburg, from Jamestown to Yorktown, for them. I have had some great suggestions, and I am going to post them on this site with an explanation about why a picture was selected. These will be pictures that are not always obvious to those who visit here. I am having a great time taking the pictures and I hope you will enjoy looking at them. 52 Weeks in Williamsburg is about special moments throughout the year, here in the Colonial Capital. I hope it becomes a special place for you. 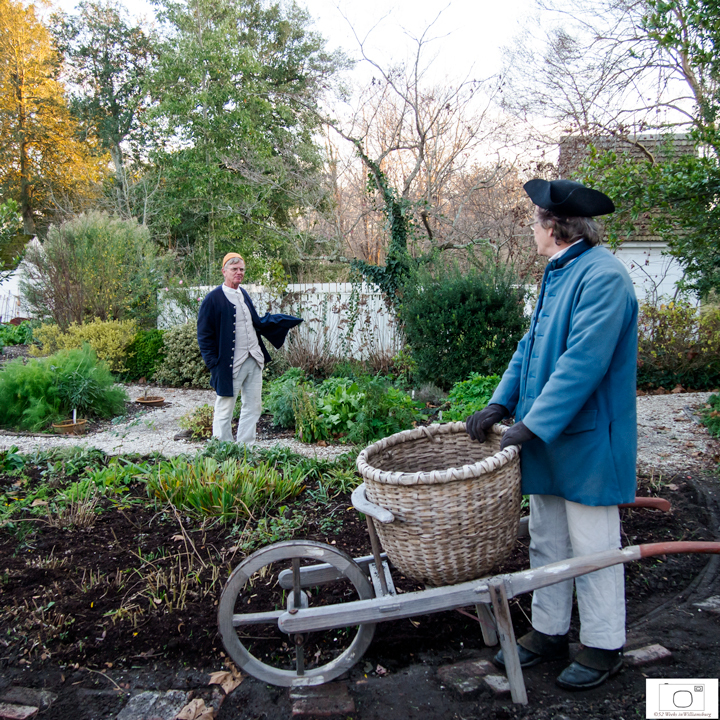 The picture above is one of my favorites because this could have been seen in someone’s garden on Duke of Gloucester Street in December, 1750. It was a cold day. You can see that the gentleman in the foreground has his gloves on and his friend is pointing at something while his hands are warm in his waistcoat. There is a gentleness and civility to this picture, and it says Williamsburg to me.